The key to Yellen’s deceptive banter yesterday was found in just two words, “appreciably lower.” This overly dovish tone leads us down a few different paths for equities. 2. The market realizes the US economy (and earnings) aren’t as strong as investors are hoping, and stocks pull back. One year chart of the SPY Index – In our opinion, the upside is limited to a few percent vs the downside of 20% over the next few months. Over the last two years, as the VIX curve has gone into deep contango (as represented by the front month and the 8th month – White line well below the Green line), this has been a sell signal for US equities. 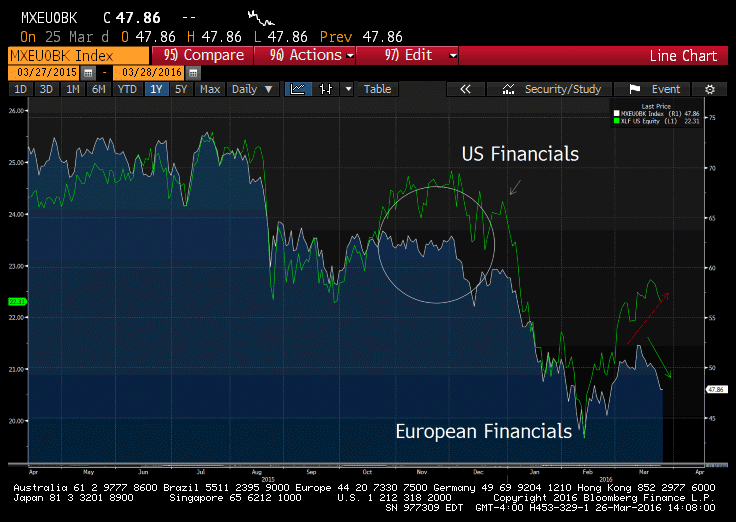 European financials started to rollover last fall, before US banks followed suit. We are seeing the same pattern today (chart below). Strong sell signals in the Eurozone financials have us on alert, our Lehman systemic risk indicators are on the rise.